Lawrenceville, GA is one of the fastest-growing suburbs of Atlanta. Thanks to a pleasant climate, surging civic infrastructure and robust economic indicators, Lawrenceville is one of the best places to live in the state of Georgia. Ever since the 1950s, when the city’s population was just under 3,000, Lawrenceville has experienced rapid growth. Today, Lawrenceville’s metro population is well over 30,000. The city’s strategic location northeast of Atlanta – along with its own surging economy – makes it one of the most attractive destinations for forklift drivers in Georgia, and throughout the southeastern United States! With forklift certification in Lawrenceville, GA, ForkliftCertificadtion.com (FLC) is your best option for getting the best forklift jobs in the city and the greater Gwinnett County region. Plus, we’re a dependable, OSHA compliant training option for employers, too. 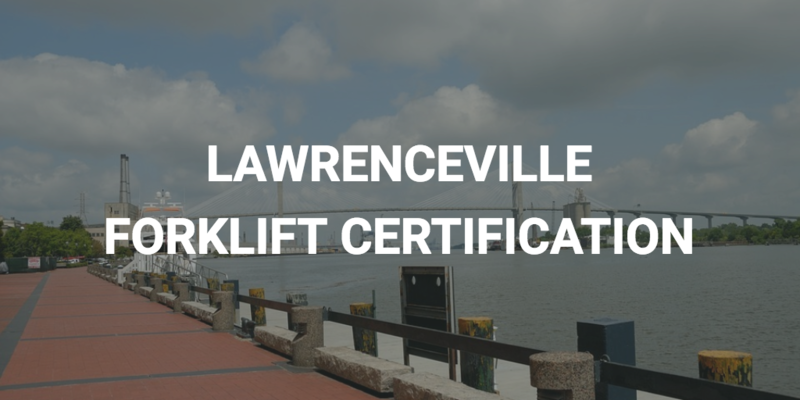 If your company relies of forklift drivers for day-to-day operations, you need a Lawrenceville forklift certification for all your employees. FLC is the best place to obtain forklift certification in Lawrenceville. We offer three training packages for anyone that needs a Lawrenceville forklift certification. Sign up today and see how FLC can get your entire workforce OSHA compliant. Our courses are used by companies across Georgia – and we’d be happy to add you to our satisfied customer list! What’s more, Lawrenceville is also home to Scientific Atlanta, one of the nation’s fastest-growing telecom companies. With FLC’s forklift certification in Lawrenceville, GA, any forklift driver will have ample opportunities to earn a good living – including you! Get Your Forklift Certification in GA – Lawrenceville, Atlanta, Gwinnett County, and More! FLC, the leader in affordable, effective, OSHA compliant forklift training, is idea for any driver looking to get forklift certification in Lawrenceville, GA. We offer three different training programs, each designed to offer premium value and customized content. Any of our courses are perfect for employees and employers that need forklift certification in Lawrenceville. OSHA and U.S. law requires that any forklift operator have proper safety training. FLC specializes in this training! • Training Kit – this is one of the best options for forklift certification in Lawrenceville, GA. It includes different classifications (warehouse, rough terrain, order pickers, pallet jacks, etc.). • Train a Trainer – some forklift jobs in Lawrenceville, GA require specialized OSHA insight. Why not become OSHA’s main point of contact at your company? Sign up today! • Bundle Package – here is the best possible option for forklift certification in Lawrenceville, GA. This package includes the Training Kit and Train a Trainer courses. Ready to take your forklift skills to the next level in Lawrenceville? Sign up with FLC today. Our forklift certification for GA – including Lawrenceville and Atlanta’s surrounding communities – will give any driver optimal opportunities in the Peach State and beyond! Click here to get started today. If you have any questions about FLC’s forklift certification in Lawrenceville, GA, call us today at (888) 278-8896.